Solar powered water pumps and solar electric water pumps. for effectively moving water using solar power. Our manufacturers engineering experience allows us to use the latest solar technology to create systems for today's consumer needs. A solar pump is practical because the need for filtration is greatest during sunny weather. It is perfect for pumping through solar heat collectors because the circulation requirement corresponds with solar intensity. 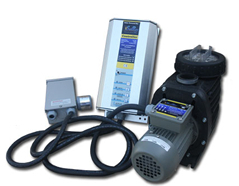 Using less power than traditional AC pumps.